Duration: The trip time from Airport to Manhattan Hotels is approximately 45 to 60 minutes. Includes: Legal fees and taxes. · You’ll receive confirmation after you complete the booking. · From all hotels between Battery Park & 125th Street. No transfers to /from private residences. · If you are travelling with children 3 years old or less it is required to use a child safety seat. Please note that it´s the parent or guardian responsibility to bring one, in the case of not complying with this requirement the service may not be provided. During the month of December you can feel the Christmas spirit in the streets of New York, it is time to celebrate Christmas, Hanukkah and New Year. The center of the city shines like never before and surprises as always. At the first stop of our tour you can see some of the most famous showcases such as Saks Fifth Ave, Lord and Taylor, Bergdorf Goodman, Tiffany and Co. Cartier, etc. 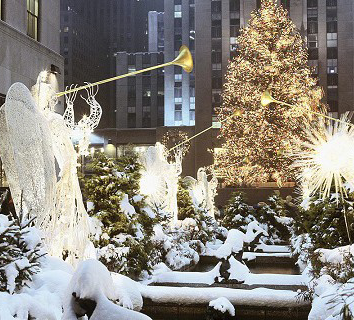 besides the imposing Christmas Tree Rockefeller Center, its famous ice rink and the Cathedral of St. Patrick. The Christmas markets take the squares at the same time that the skaters open the Ice Tracks and they become the perfect place to warm up with a warm apple cider while they go through their stalls of handmade products, local art, winter clothes, traditional foods, desserts ... We will go through some of them and without a doubt our guides will give you all the information so you can. Among the most popular are: Winter Village, Bryan Park, Grand Central Holiday Fair, Grand Central Station (Vanderbilt Hall), Union Square Holiday Market or Columbus Circle Holiday Market. Our tour continues to one of the most impressive places in the city at this time. A neighborhood located southeast of Brooklyn, near the Verrazano Bridge known as Dyker Heights, where homeowners openly compete every year since 1980 to see who gets the biggest and most dazzling Christmas decorations, that can worth up to $ 20,000. Once back, our last stop will be at DUMBO, which has one of the most privileged views of Lower Manhattan. In The Esplanade a long viewpoint from which we can photograph in all its splendor the Brooklyn Bridge, The Statue of Liberty and the South Skyline of the island of Manhattan that we have seen in so many films. Duration: The trip time from Manhattan Hotels to Airport is approximately 50 to 60 minutes. Doesn’t include: Suggested tips and gratuities. Language: We offer Assistance through our phone lines in Spanish and English. Enjoy our hotel in Times Square, New York City. Set in the heart of Times Square, Millennium Broadway is your quiet escape in the city that never sleeps. Enjoy convenient access to New York’s famed Broadway theatres, including our very own Hudson Theatre. Take in iconic sights like Radio City Music Hall and Rockefeller Center. Treat yourself to world class dining, shopping and more – it’s all possible from our convenient, central location. Set against a spectacular New York City backdrop, Millennium Broadway features 626 spacious and tasteful rooms with oversized bathrooms and thoughtful amenities. Higher floors offer breathtaking views of the Chrysler Building, Empire State Building and the glittering light show of Times Square. Take a step back from the hustle and bustle of NYC and unwind.